The View! The View! 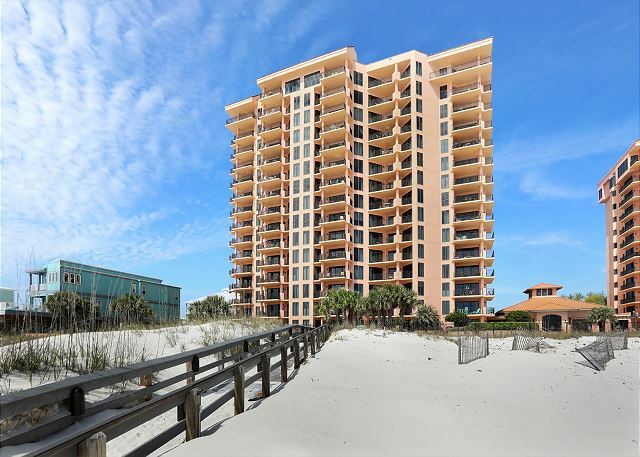 503W is an exceptional 5th floor Unit with beautiful beachfront views of the Gulf of Mexico. 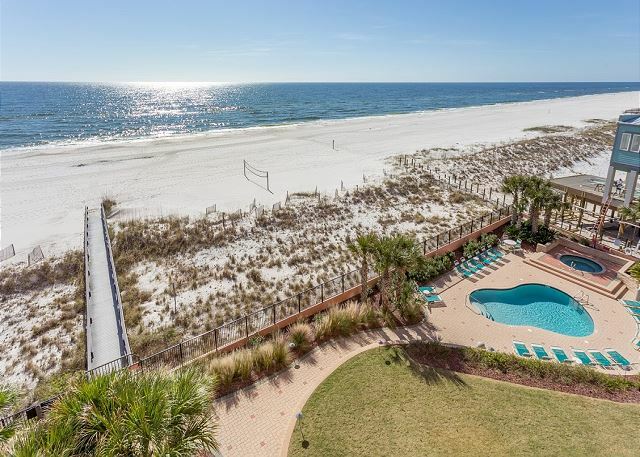 This Unit is the perfect level with unobstructed views of east and west beaches. 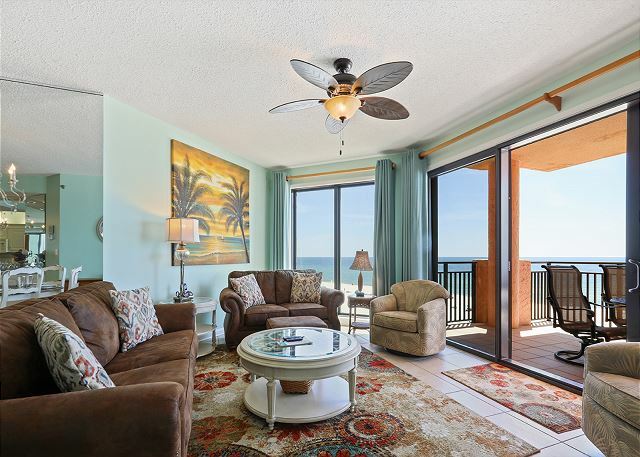 The turquoise colors of the water from the Gulf can be enjoyed from the Living Room while relaxing on the sofa or the King size bed in the Master Bedroom. Both areas have full length windows and sliding glass doors opening onto an amazing balcony. Enjoy that first cup of coffee as the sun rises or sleep in and later enjoy the sunsets while sitting on comfortable balcony furniture. 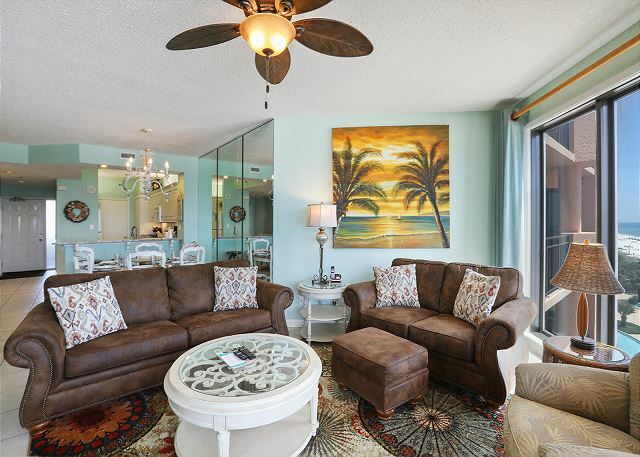 503W has become a renter’s favorite with features like 9 foot ceilings, tile throughout, ceiling fans, two King Size Beds, beach toy closet for the kids, games for all ages, Free WiFi, Free local phone calls and 55” 42” and 32” flat screen televisions. This 5th floor condo has 1341 square feet of updated furnishings for your relaxation. The Dining area provides that “just like home” atmosphere with lots of comfortable seating for the whole family. 503W includes a Queen Sleeper Sofa, Loveseat and Two Swivel Rockers. It also offers elegant but casual dining for six with three adjustable height stools for the granite breakfast bar. Sit back and enjoy the convenient wet bar with mini chandelier, sink and separate icemaker stocked with glassware for your use. 503W has a well stocked kitchen furnished for a chef! Microwave, dishwasher, electric glass top stove, refrigerator, granite counter tops, lovely tiled backsplash, beautiful white cabinets, Ninja Blender, Keurig K-Cup & Cuisinart Coffee Makers, Toaster, Slow cooker, Waffle maker, Electric Hand Mixer and Electric skillet. Just off the kitchen is a separate laundry room with full sized washer & dryer, iron, ironing board and vacuum cleaner. Master Bath: Jetted tub, separate glass enclosed shower, double vanity and a 10X wall magnifying mirror. A large walk-in closet with chest of drawers for extra storage, laundry basket, two folding chairs as well as a 3 drawer linen unit are provided. Sheets, blankets and towels are furnished. Forget your beach towel – no worry as we keep a few extra on hand. Books Saturday to Saturday, Monthly Rentals Available. This was a fantastic condo furnished with everything you'd ever need or want. The breathtaking view was worth every minute we were there. Bahama Bob's had the best fried shrimp and Sea 'n Suds had the best fried oysters. Don't miss out on eating at Lulu's and enjoy an ice cream cone at Scoops. This unit is beautifully equipped with comfortable furniture, nice linens and plenty of kitchen dishes and cooking utensils. Everything in the unit and surroundings are very clean and neat. This is the second year we have been in this unit and plan to be here next year. I have not had a true get away vacation in years. From booking the property to checking out , it was easy. The property was amazing. The view was better than the pictures. It was truly set up to be a game away from home. Great restaurants just minutes away in either direction. All in all perfect. Totally recommend SeaChase we stay here every chance we get and this year we stayed in 503W, beautifully decorated and comfortable beds, everything you need is in this unit also owners are very thoughtful they checked in on us to make sure everything was ok. SeaChase has beautiful grounds and the pools are amazing, we will definitely stay in 503W again!! Thank you for using the Aronov Gulf Coast team for your SeaChase reservation. We appreciate your feedback and will pass it on to the condo owner. We hope to see you at SeaChase again soon, and remember, you can request 503W when you come back! The entire rental experience was Great from beginning to end. Staff was super friendly and the condo was beautiful. We had an excellent view and saw dolphins every day! We are looking forward to planning a trip back next year!! We decided at the last minute to take this trip, and was able to book it a week before we came. It was so simple, one quick phone call and we were set! As you can see by the scores below, the stay was fantastic. Everything was really good as always. The only issue we had was internet service. It was very slow the entire week. Other than that, we could not have asked for better accommodations. We will be back next year for sure. Thank you for choosing the Aronov Gulf Coast team for your SeaChase vacation. We're glad you enjoyed your stay with us and hope to see you again soon! We have passed on your comment on the internet service to the property manager. 503W is a beautiful condo from top to bottom. 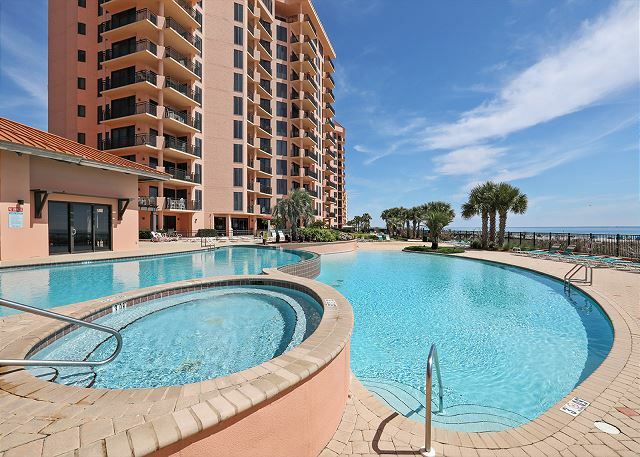 The location is perfect, the view of the ocean is amazing, and the condo has everything you need and/or want. We cant wait to come back and stay in 503W! Thank you for choosing the Aronov Gulf Coast team for your SeaChase vacation. We're glad you enjoyed your stay with us and hope to see you again soon! You can always request to return to a particular condo; just remember that some of them book up quickly! We have stayed at SeaChase numerous times, and rented different condos in East, Center and West buildings. Always a great experience. SeaChase is perfect for our little 3 year old angel who loves the pool and water facilities. Beach access is wonderful. Views from the balcony are awesome. Looking forward to our next trip to SeaChase. Thank you for choosing the Aronov Gulf Coast team for your SeaChase reservation. We're always glad to see our return guests and hope to see you again soon! We enjoyed a great week in 503W in Seachase. The unit is well-appointed and comfortable with an unbeatable view. Thank you so much for booking with the Aronov Gulf Coast team. We're so glad you enjoyed your stay at SeaChase and hope you return soon! Seachase is our favorite place! We had a wonderful second -time stay with our kids at Seachase from March - April 7, 2018. We couldnt be more pleased with the accommodations and the condo unit. Weather was beautiful. We had a blast. Thank you! Loved condo 503W. very clean, and I am very fussy about this. Also everything you could possibly want was in the condo. Only complaint was that the wine fridge was noisy. Our 21/2 months stay at SeaChase503W has been most enjoyable. The accommodations are beautifully decorated,comfortable,well equipped and very clean. Useful information for phone numbers and WI-FI is included. Extra electrical outlets are provided for technology. The staff is very helpful.Karen does an outstanding job of addressing questions and concerns. Maintanence and security people do a great job also. We like the location as it provides easy access to shopping and restaurants. We have made reservations for next year . Thank you! See you next winter! My wife and I have been meeting my brother at SeaChase for a week every Sept for the last 31 years with the exception of 3 years when Ivan was the visitor. We were actually at SeaChase the week it came in and had to leave. Our room was great, as usual, and this year exceptionally great. We've stayed in this room numerous times in the past but it is now under new owners and has numerous upgrade. It was very nice and comfortable. Overall Seachase continues to be a great property except that the gym could use some improvement! 503W needs a quieter ice maker and bar stools that actually reach a height so that people can eat from the bar area of the kitchen. The new traffics schemes in Orange Beach leave a lot to be desired - not sure who came up with all those - hope the city didn't pay a consultant because you should get you money back!!! I love this condo! It was well equipped and so clean. I was so pleased. The weather gave us a bit of trouble during the week but it really didn't matter because there is no bad day at the beach and we were extremely comfortable. The master bed is to die for. I will rent again! 503w was amazing. The owners thought of everything. Beautiful updates and so clean. We had an amazing weekend stay in 503W! The furniture and beds were comfortable and there was ample amount of kitchen and dining space. The weather was amazing! My 3 year old twins were constantly entertained between the splash pad, mushroom, and all of the pools. My husband and I enjoyed the beach while the grandparents watched them swim. I would definitely be interested in staying here again!